so mostly working in the yard today. making another small brick patio. i somehow managed to forget over the course of a year what back-breaking work laying a brick patio is. i worked myself shaky. but, i'm getting lots of cool ideas about they yard in general, and things are starting to come together. i spent some time looking up glass bottle walls. i'd really like to make a half wall as our back fence. it'd be crazy work, but we wouldn't have to contribute any glass to recycling for a long time. also, if we wanted to speed it up it'd be pretty simple to get donations. take a bucket to a party. there you go. easy. 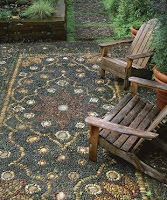 still planning and researching outdoor mosaic surfaces. 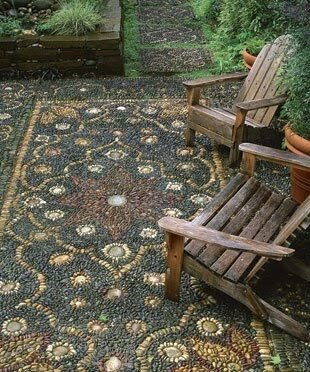 this one is a really intricate pebble rug. i'll never have the patience for it, but it does inspire. i'm thinking more large tile, bright colors. but this sure is pretty. reminds me of the seashell grave tops in the cemetery at my mom and dad's. i've been writing some songs. trying to do the live thing and unhinge myself from my recording addiction. i just keep writing beginnings of songs, though. i know one will stick around for an ending. i've always done that with songs. even though i'm trying to break my recording songs habit, i'm still doing clip recordings so i can go back and check stuff out. i can't give up the habit completely yet! mostly i just want to make sure that i'm able to perform what i'm writing so i'm easing up on the layering and making sure i can do it live with a loop pedal. i hope to have some new songs to perform soon. although i'd rather get a portable power source and do a street performance than a show. also, flash mobs are still on the brain.